A blog of Fairfax Baptist Church intended to share insights from the Word of God (Bread Crumbs). 23% of Americans equates to approximately 80 million people. For comparison sake, choosing from numbers published this week, over 90 million watched parts or all of just six (6) of last week’s fifteen (15) games in the NFL. (2) Add to that the number of people who watched the playoffs in baseball, college football, etc. and you can see that sports are a big deal for television, which doesn’t even count local school and non-school related sports and leagues. So, sports dominate over a time of worship. 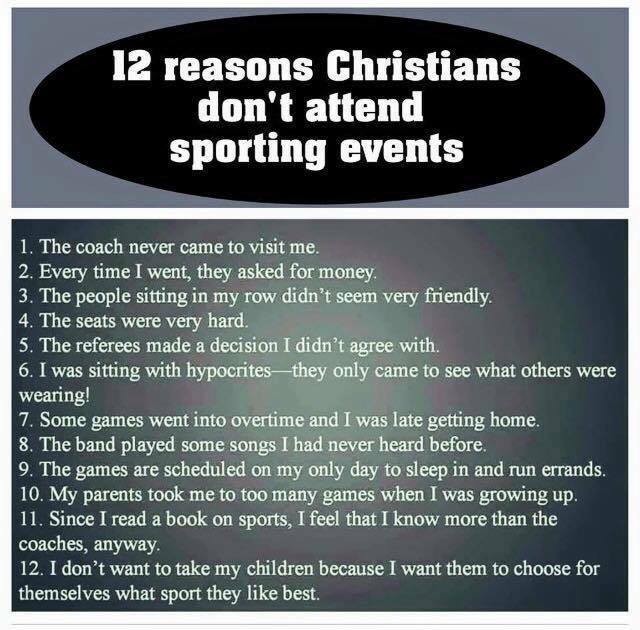 And many people will use excuses to not come to church that they would not use about sports. The following information has cycled through the internet many times, but it does provide a reminder for how shallow some excuses really are. The reality is we worship what is important to us and we make excuses to avoid what is not important. God knew this, which is why He gave us commandments about worship. In our hearts, we will worship something, but our goal must be to make the object of that worship something truly worthy of worship. For the Christian, the object of worship is not an it, but a who – God Almighty. But that is not just true for the Christian, it is true for mankind in general because we are told that we have been made in His image. Of all Creation, only man was made in the image of God. Therefore, our goals, our desires, our purpose, and, indeed, our worship, must be toward Him. Indeed, it must be about Him. The point of our life is ultimately not about us – it is about God. Many know this, but it is hard to remain true to it. Yet, we are reminded of this truth in a teaching apparatus used for children since the 17th Century. The Westminster Shorter Catechism begins with the question: What is the chief end of man? The answer: Man’s chief end is to glorify God, and to enjoy Him forever. If that is man’s chief end, it is the chief end of the church as well. We are not perfect, but perhaps the story we see today will encourage us to live more like those in the early church. Acts 5 begins with the story of Ananias and Sapphira being killed for lying to the church. Then, many miracles and wonders are done. But this gets Peter and the other apostles thrown into prison. But notice what happens. An angel of the Lord opened the prison doors and told them to go stand in the temple and speak about Jesus. I think many in our day would have heard the first part of that statement and gone on their merry way. “Look God has released us, let us go home, watch some TV, and stay out of sight for a few days.” But that is not what the apostles did. Despite the fact that they were out of the frying pan, they were now going to be directly in the fire. Speaking about Jesus in the temple would certainly draw the attention of the religious leaders – the same leaders who had just put the apostles in prison the night before (v 17-18). So, the next morning, the high priest called together the council and the political leaders of Israel to put the apostles on trial, but the apostles were not in their cells. They soon found them “standing in the temple and teaching the people” (v 25). The apostles were then asked to follow to the trial (notice the guard dared not do it by force for fear of the people (v 26). Again, if chains were released and doors were open, I think most people today (even Christians) would simply escape to a place where they believed they would be safe from returning to prison. But the apostles heard the message from the angel and did not dismiss it. Rather then seeking safety, they followed God’s command and actually put themselves in harm’s way. That is knowing and trusting God. That is truly bringing God glory. Beginning in verse 27, the apostles are before the council. Verse 13 says “all” of the apostles were present, but does that mean twelve (now including Mattias), or 120 (as was in the upper room in Acts 2)? We simply do not know for certain. I tend to think it is the lower number, but we have no way of knowing. Likewise, we do not know how many were present in the council. The usual council was 70 members, but verse 21 said members of the senate were present as well. So we can guestimate that upwards of 50 were present, at a minimum. If so, the likelihood is that the apostles on trial were outnumbered by the leaders, perhaps by a 5:1 ration or maybe even greater. In other words, the odds were stacked against them from a human standpoint. But when the high priest reminded the apostles that they were ordered not to teach about Jesus, Peter responds by answering with a statement which would have everyone in agreement: We must obey God not man (v 29). The problem is that the religious leaders believed they were God’s spokesman, not the uneducated fishermen and others before them. But Peter continued with a charge against them – it was the leaders who were responsible for Jesus death on the tree (v30). But God! But God raised Jesus. The apostles witnessed it. And all they are doing is telling others what they had witnessed. Peter spoke more than just some of the truth, he spoke the whole truth and nothing but the truth while he stood on trial. The reaction – the leaders now wanted the apostles dead. At this point, the apostles are taken out of the area so the leaders can discuss what should happen. Let’s follow two lines of thought here. One we know. The other will cause us to consider our reaction. What we know is that one of the most respected Pharisees made a case to let the apostles go. The man, Gamaliel, was the man who taught Paul (see for instance Acts 22.3). His argument was that other “great leaders” had come and led others to believe something great but each time they faded away. The same would happen to this new teaching if it was from man, but if it was truly from God, nothing can stop it, and you “might be guilty of opposing God” (Acts 5.39). Personally, I want to be counted in the second group. But in the moment, what would I have done? What would I do today? Do I allow my speech, and even my worship, to be dictated by my surroundings or by my reverence for God? What about you? The religious leaders called the apostles before them, had them beaten, and said, “No more talking about Jesus!” What was the reaction of the apostles? To praise God for being beaten and continue to proclaim the name of Jesus. The truth is that we make time for what is important. We talk about what is important. We give to what is important. We can check our calendars, our conversations, our bank statements, and especially our prayers to know what is truly important to us. For instance, we often pray for safety, and I get it. But the disciples were more worried about being bold for Jesus (Acts 4.29) whatever the cost. That is true reverence. That is complete worship. As we take a high-definition look at our church, we have to ask where we fall short of the biblical standard of worship. Worship is more than singing, praying, teaching, and giving. Worship is knowing God and taking time to be with Him. Church, do we obey God’s word or do what is comfortable to us? Do we speak His truth or do we cower when opposition is, or might be, present? Do we seek to fulfill our goals or to find God’s purpose in our lives and fulfill it completely? For me, I see a difference in how the apostles lived and how I live. Of course, they were not perfect. And, sometimes, I get it right. But, on the whole, I have no doubts that their degree of faithfulness to Jesus was greater then than mine is now. Most people today are looking for a God who will satisfy them rather than seeking how they can serve Him. That is true in 2018, but it has been true for decades. Listen to this quote from a book by David Wells written in 1994. If that is our view of God, then it will impact how we see and serve His Church. We must move beyond the idea of a God who serves us in order to ready to be a people who serve God. As I said a few weeks ago, the only thing I have complete control over in this church is me. I must seek to make changes in my life that allow me to better revere God. I must partner with the Holy Spirit to allow God to mold me into the servant He wants me to be. If I do that – if each of us does that – then we will become the church that He desires us to be! So, I will state right now that if they Chiefs make the Super Bowl and are set to begin play at about 5:15, I will be at church at 6 pm. Now, that said, last year I considered using the game as a means of outreach to the community, but we had just come back from Kenya. So this year, I am doing further research on this idea to ensure we do not violate any copyright laws. But if we do show the game, and serve food, and engage in some meaningful fellowship, we will pause to make sure that we take time to give glory to God because ultimately nothing else matters. The JOURNEY letter for this week is: R – REVERE. Jesus said, “And I, when I am lifted up from the earth, will draw all people to myself” (John 12.32). He meant that in a literal way – being lifted up from the earth on two pieces of wood and held there by spikes. And He meant that in a literal way, after He rose from the dead and was taken up to be with the Father in the place we call heaven. But He means for us to lift Him up in our lives as well. He wants us to bring Him glory in what we do, in what we say, and in how we live. Like the early apostles, He wants us to bring Him glory in our obedience, our speech, and by fulfilling our calling as a child of God. If we do these things then we will show Him, and the world that we truly revere Him. PRINCIPLE: Worship is more than coming to church; it involves giving every part of us to Someone greater than us. QUESTION: What can I do that, if done well, and done for Jesus, can make a difference in this church? LEARN: Take an honest inventory of your life to determine any areas that you hold for yourself instead of giving to God. LIVE: Commit to giving more of yourself to God. Begin to live with an abandonment of self because of a complete trust in God. This can begin to happen by actually doing the answer to the question: What can I do that, if done well, and done for Jesus, can make a difference in this church? LOVE: Love God, love others, and love one another (Mark 12.30-31; John 13.34-35). Loving is not always easy, but if we love Jesus, we will obey His commands (John 14.15). LEAD: Only one truth can save any of us – knowing that “the Christ is Jesus.” Help others to not only discover this truth, but to embrace it in their lives. They will need an example to follow – so learn to lead them well. (1) https://www.statista.com/statistics/245491/church-attendance-of-americans/ - accessed Oct 12, 2018). (2) http://www.sportsmediawatch.com/nfl-tv-ratings-viewership-nbc-cbs-fox-espn-nfln-regular-season-playoffs/ - accessed Oct 12, 2018). (3) David Wells, God in the Wasteland: The Reality of Truth in a World of Fading Dreams (Grand Rapids: Eerdmans, 1994, 114). (4) (https://www.si.com/nfl/2018/02/04/how-many-people-watch-super-bowl-viewership-ratings – accessed Oct 12, 2018).